Preparation time: 10 minutes. Cooking time: 8–9 minutes. Peel carrots and slice into 1-inch pieces. Place in a microwave-safe dish, add 2 tablespoons water, and cover with lid or microwave-safe plastic wrap. Microwave on 100% for 8–9 minutes, or until tender when pierced with a fork. Drain water. In a small bowl, stir together melted margarine and Amaretto. 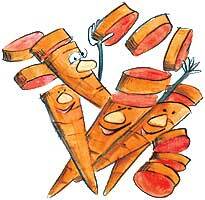 Drizzle evenly over carrots and toss to coat.